At just 41 grams, SOI takes up very little space. But it’s still powerful enough to provide plenty of light. Thanks to high quality LEDs and optimized electronic circuitry, SOI is highly energy efficient, it just beams and beams! FIND ANYTHING IN YOUR PURSE EASILY - A study shows that on average, a woman spends 76 days of her life searching in her bag. 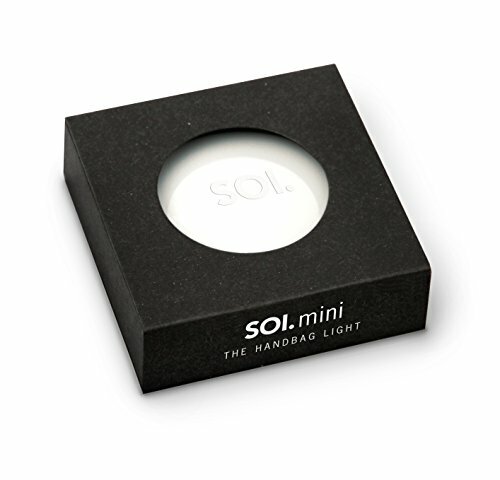 This is valuable time that the SOI Mini handbag light can help you put to better use. Stop searching, and start finding! ACTIVATE THE LIGHT BY MOVING YOUR HAND - Simply put: an approaching hand (or a light tap) will make the SOI Mini light up. The proximity sensors utilize energy fields from your hand to activate the light without the need for any buttons or switches. AUTO TURN-OFF, NO BUTTONS/SWITCHES - Once the SOI Mini is lit, the light remains on for 10 seconds before turning off automatically. The sensor-driven technology makes switches, buttons & cell phone lights obsolete. Just wave hand to turn it back on! MINI SIZE FITS IN THE SMALLEST HANDBAGS - Designed in addition to the original SOI in a smaller size, you can now use this mini light in any purse, clutch, carryon totes, toiletry bag, makeup bag, etc. it's also useful for camping and car trunks. ALSO CAN BE USED AS A BED AND TRAVEL LIGHT - Save battery on your cell phone: instead of using the flashlight function, leave the SOI mini by your bedside as a lamp or nightlight. It's small & lightweight so take it with you anywhere while traveling!